The intersection of 15th Street and Third Avenue was a hubbub of building activity in the late 1890s. Within a two month period in early 1897, a $112,000, 60-room Rock Island County courthouse and a new Memorial Christian Church opposite it were dedicated. Almost exactly a year later, a ceremony was held at the third corner to celebrate the cornerstone-laying for yet another imposing structure – the Modern Woodmen of America Headquarters building. The fraternal life insurance company had made a decision to go downriver to Rock Island from Fulton in 1892, although the actual move didn’t take place for a few years. 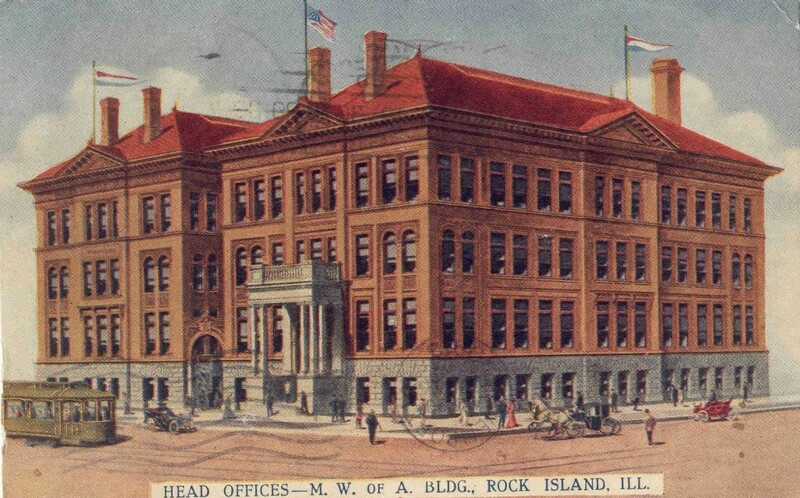 In anticipation of the move, Rock Island architects Leonard Drack and George Kerns were commissioned to design a suitable headquarters building. 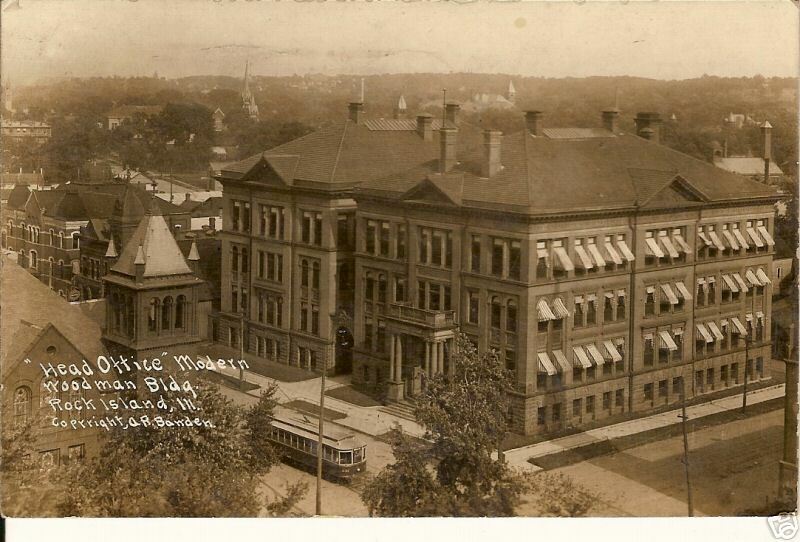 Their firm, which had been a close second choice to design the courthouse, would later create such prominent Rock Island buildings as the Public Library, McCabe’s Department Store on Third Avenue, the London Building (now Quad City Arts), as well as many homes. The Argus published the architects’ drawing of the Renaissance style headquarters in late 1896, saying it would be constructed of pressed brick with stone and terra cotta trimming. At that time, it was still undecided whether the basement foundation would be of marble, sandstone or granite, but the four-story, building would definitely be fireproof. The steel, stone, and brick structure was expected to cost $80,000. The cornerstone laying on April 27, 1898, was an occasion for great celebration. Architects Drack & Kerns designed a “commodious” platform that completely covered the already-built 118 foot by 75 foot foundation. Dignitaries were admitted to the platform by invitation (and ticket). Many MWA camps from around the country marched to the formal event in a parade that started at Spencer Square. The keynote speaker was William Jennings Bryan, who arrived by train. Bryan, who would soon run for United States President against William McKinley, was known as the “silver tongued orator.” The actual cornerstone-laying was bracketed by a variety of speeches and musical interludes, all for the enjoyment of the estimated 15,000 spectators. Today’s postcard, postmarked in 1912, is from the collection of Greg Binder. The original MWA Headquarters building is at the right. As another speaker William Jackson put it, “It shall symbolize by its symmetry, beauty and strength the great purposes of the order (of Woodmen).” Today, the magnificent granite porch at the original entrance is as shiny and pristine as ever, and the half-round transom above the main door still has its beveled glass held within wide muntins. The building space was doubled in 1904 with a $150,000 annex described as the exact duplicate of the original building, but without its porch. This is seen at the left of the postcard. When occupied in early 1905, it was called the “most conspicuous improvement in Rock Island.” It was probably designed by Leonard Drack who was still practicing architecture here. The two buildings were separated by a small courtyard that contained passages at the first floor level. Elevated walkways joined the second and third floors of the two buildings. The postcard shows the two buildings linked by an arched gateway entrance into the courtyard. The courtyard – too narrow to be very functional – was later completely enclosed, creating a second ground level entrance that is used for public access today. An elevator was also added in the former courtyard space. Enclosing the space also required joining the roof structures of the formerly separate buildings. These changes may have taken place in 1940 when a major remodeling occurred. The masonry, windows, trim, and roof of the enclosure were perfectly matched to the two original structures. The only clue that something has been changed is seen beneath the eaves, where the ornate terra cotta frieze of the two buildings gives way to a plain panel in the filled area. MWA moved into a new riverfront building in 1967 and sold their former headquarters to Rock Island County, which maintains offices and other facilities there. 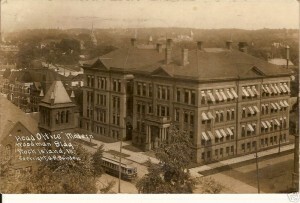 Although the main functining entrance has been moved to the courtyard addition for security reasons, little else has changed from this historic postcard view. This article by Diane Oestreich is slightly modified from the original, which appeared in the Rock Island Argus and Moline Dispatch on September 3, 2006.